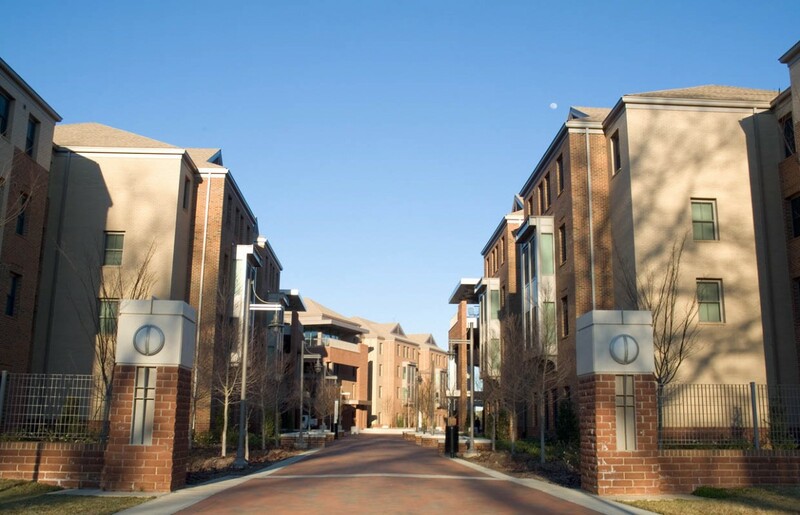 The Wolf Village Apartments at North Carolina State University is an eight-building complex that accommodates 1,200 upper classmen. Situated at the corner of Gorman Street and Western Boulevard, it has alleviated overcrowded residence halls and reduced the need for off-campus housing in neighborhoods near the university. The project also serves as the campus gateway for those entering from western Raleigh. Stewart provided structural and civil engineering services for this development. The project was phased to include an early site package for rough grading, erosion control, stormwater management, and utility installations. These activities were followed by fine grading, paving for 800-space parking lots, pedestrian walks, and extensive landscaping. A key challenge of this project was addressing the stormwater requirements for the desired density. Innovative stormwater management techniques and solutions were designed for this high-density, 30-acre site and included staged rain gardens (bio-retention), wet retention ponds, and constructed wetlands. Engineering design and calculations required an advanced software-aided approach for accurate modeling of stormwater peak flows and nutrient reduction. The stormwater system was designed to retain stormwater on-site and to decrease the discharge flowing into the existing stormwater infrastructure on campus. The project also required extensive coordination with the Construction Manager at Risk and three other new projects adjacent to the site concurrently under construction. Centex Construction Company was presented with an EDGE Award from Triangle Business Journal for this innovative project.